Tried-and-true editing techniques take center stage in the most memorable ads of the primaries, writes the founder of post-production company PS260. What strikes me this campaign season isn’t all the crazy talk about hair and secure emails, but the various styles of film editing in the candidates’ advertisements. When we look back on the 2016 election years from now, it will be seen as not just a political revolution with massive media and communications implications, but a revolution in the way the candidates speak to audiences. Hillary Clinton and Bernie Sanders, who built their careers in a political landscape that centered on TV and newspaper ads, have to compete against Trump in earned media and also control and disseminate their message across multiple social media channels. In the face of these new media challenges, one old-school creative tool is proving to be more important than ever — editing. 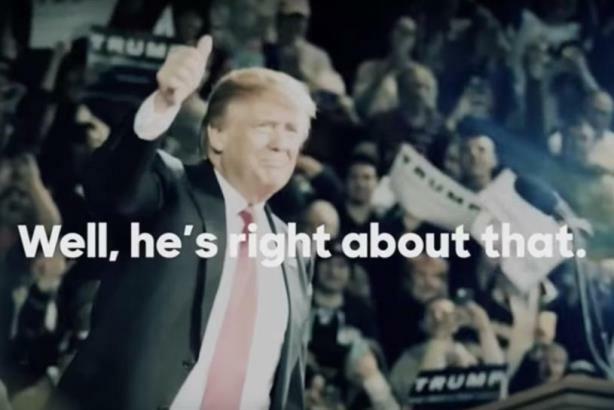 The Democrats are bridging past and present with old-style ads that are ripe for viral distribution, and so far, two stand out as iconic ads of the primary season: Clinton’s attack ad against Trump and Sanders’ "America" ad from earlier in the season. Editing plays a huge role in what makes each successful and I bet both will set examples for future candidates trying to hone their message in an era of content chaos. At first glance, Sanders’ ad is a classic example of a politician focusing on an emotional appeal driven through music and iconic Americana imagery. Even Clinton praised it, saying, "Look, you campaign in poetry, you govern in prose. And we need a lot more poetry in this campaign and in our country." The ad is indeed poetic, as it captures the passion and excitement of Sanders supporters, set to a hopeful, upbeat Simon and Garfunkel song. Using an established music track is one of the biggest tricks of the trade and a traditional ploy from many politicos of the past, such as Walter Mondale whose "Teach Your Parents" ad included the popular Crosby, Stills & Nash song "Teach Your Children." For brands and politicians alike, a great song immediately taps into the viewer’s life experiences and creates borrowed equity to enhance the commercial. However, the most interesting thing about this ad is how it evolved. The spot was re-cut at least nine times as the campaign progressed, each time to reflect the issues, demographics and geography of a primary state. Candidates used to rely on ads that had to see them through the season, now they can adjust their messages in real time. In editing, we call this versioning. Sanders’ original was criticized for its inclusion of mostly white supporters, which made it all that more noticeable that the New York version featured many more people of color, and more accurately reflected the voter pool in the state. If Sanders’ spot was meant to make you feel warm and hopeful, Clinton’s was meant to scare the crap out of you. Built entirely around news sound bites and a clever graphic device, Clinton lets her rivals do the talking as a host of Republican leaders rip apart Trump, calling him, among other things, amoral, vulgar, and a bully. In the background, staccato, almost playful music adds a circus-like element that feels painfully reflective of this election cycle. The ad is meant not only to show Trump in a poor light, but to also highlight the divisions in his own party. It is a prime example of the power of editing to drill down to an essential truth. Remarkably, in just over a minute’s time, the piece powerfully and concisely communicates the stark criticisms of his rivals, and backs up each of their statements with his own words. While watching it, I thought it was a viral ad created by some smart person at home with editing software. The entire style has an authentic nature to it, as if someone sent it on Facebook or Twitter — as if Clinton was your friend and posted, "Hey watch this!" When you look deeper at the formula that all of Clinton’s ads in this campaign are following, it’s clear that her team is using many traditional editing techniques that are reminiscent of historical political ads. First, the spots use quick sound bites in an atonal, non-linear structure. Past candidates have often leveraged this technique to visually reinforce their messages. Remember the Bush-Cheney ad that used quick cuts of John Kerry wind-surfing to portray him as a flip-flopper? Typically, editors use this technique to establish chaos — precisely Clinton’s view of the Republican Party. Second, there is heavy use of graphics that simply transcribe the sound bites. Clinton also uses an extra large sans-serif font as a metaphor for her bold campaign. As the campaign continues — and boy is there still a long way to go — it will be interesting to see not just what the next political gaffe is, or how the media is playing out the latest developments, but how the candidates and their teams tailor their content to support their messages through editing. JJ Lask is the founder of post-production company PS260. This article originally appeared on Campaign US.